Given the evolution of buildings and structures, stair parts and materials have come a long way from the simplistic flat rocks and logs used in earlier versions. Clearly, stairs are a practical means of moving from one level to the next. Staircases help people move beyond elevation, offering more in regards to aesthetics, symbolism and psychology. To agree with Rockwell is to acknowledge that all staircases have a shared language of sorts, and this is found among common elements. Treads, risers, nosings and stringers are examples. Moreover, it’s these foundational components that help builders, designers and architects construct a number of stair shapes and configurations. Even so, with the merging of materials comes the blending of myth and practicalities. In other words, while staircases do serve an important function, their design should also incorporate a client’s memories and dreams. Similarly, a staircase should reflect the way one feels about their surroundings. As an example, imagine walking up a staircase. The materials and dimensions of the staircase determine where to plant one’s feet, as well as how quickly one can climb the staircase. In the same way, one’s perception of safety and the space around them correlates with each step. An example is a wide stair tread that requires a slow, steady pace. By contrast, consider a narrow spiral staircase with tall risers, and how a particular design carries with it a sense of urgency with short, quick steps. 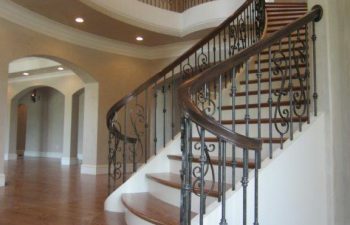 Southern Staircase | Artistic Stairs maintains a strong national presence built upon our reputation as a top quality, service-driven manufacturer. As such, our company has been selected as a staircase manufacturer for many elite commercial and residential projects from coast to coast, including Burberry, Cartier, The GAP, Panerai, Lexus, fraternity and sorority houses and countless luxury home communities. With an innovative approach, Southern Staircase | Artistic Stairs goes to the next level of design—time after time. What’s more, our team understands the unique blend of talent and artistry needed to customize a staircase that will surpass expectations in form, function and safety, while exuding richness and warmth. To speak to one of our staircase design experts, call Southern Staircase | Artistic Stairs today.